VTI is an index fund* that perfectly replicates the performance of the entire USA stock market. VTI is an abbreviation for the fund’s name – “Vanguard Total Stock Market”. With VTI, you are invested in approximately 100% of the U.S. stock market (3795 stocks). VTI tracks the CRSP US Total Market Index**. VTI matches or betters the performance of the DOW. Whenever commentators talk about how “the market” did, they always start of with information about the Dow Jones Industrial Average; i.e. the “DOW”. The DOW is the single most talked about indicator of how the market is doing. The chart below shows that VTI (green/red bars) matches or exceeds the performance of the DOW (blue line) and the S&P 500 (green line)for the last 15 years (VTI started 15 years ago – that’s why there are not more comparison years). If the DOW/S&P 500 are up, VTI will be up (maybe more than DOW), if the DOW is down, VTI will be down too. In August of 2015, the “market” fluctuated wildly; let’s see how VTI compared to the DOW. 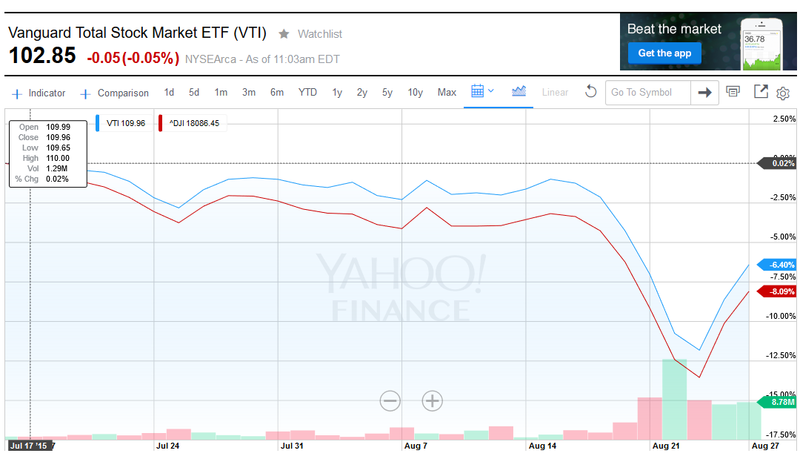 VTI fared better than the DOW… the DOW was down 8.09%, VTI was down by 6.57%. Even more evidence to put all your eggs in the VTI barrel. Many of the pages that follow use the DOW as the comparison investment to other investment opportunities. This is because many many websites compare themselves to the DOW. Remember that VTI matches or does better than the DOW. 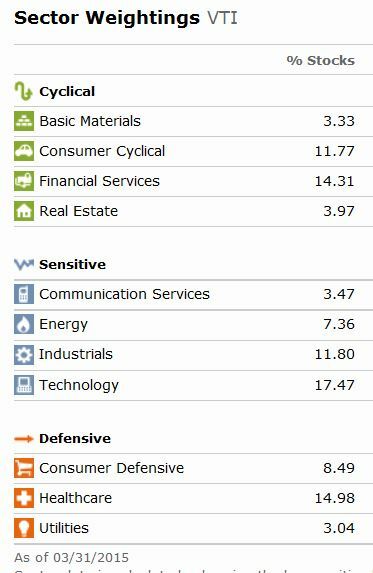 VTI matches or betters the performance of 15 highly recommended portfolios. 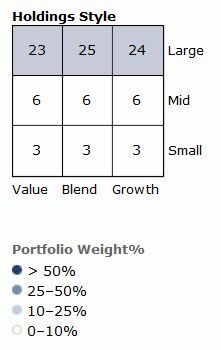 PortfolioCharts evaluates 15 well known “named” portfolios. VTI, Total Market Index Fund outperforms all of them. EVERY fund, whether mutual fund or index fund has a hidden management fee. The management fee for VTI is 0.05%. That is THE lowest management fee possible. Mutual Funds typically have fees in the vicinity of 1.35%. In the 25 year period between 1974 and 1998, the difference between the index fund fees and the fees charged by annuity managers for their funds would have cost you over $600,000! Yes you heard right; over six hundred thousand dollars. Evidence that supports that fact can be found elsewhere on this website. Because VTI is invested in high quality companies that pay dividends, you receive a dividend too. VTI is required to pass along to you, its shareholder, whatever dividends it receives from the companies in it’s portfolio. Currently that is 1.85%. During your accumulation period, you will want to reinvest (automatically done for you) your dividends. Mutual Fund managers buy and sell securities in their portfolio all the time. A typical mutual fund will change its portfolio by as much as 50% in one year in the pursuit of “performance”. That means they are selling stocks in which they have a profit. That means there are capital gains taxes to be paid. Those capital gains taxes are passed on to you. You have to pay the capital gains tax. VTI Gives You a Diversified Portfolio. The companies included in VTI’s holdings represent every sector and every investment style recommended for a diversified portfolio. You will participate in these sectors of the economy. You will participate in all styles of investment vehicles. Every stock falls into a “style” category. Investment advisors recommend that you have representation in several diverse styles. With VTI, you are represented in EVERY one of the nine style categories. The numbers in the boxes represent the percentage of VTI’s total assets allocated to each of the nine styles. You will participate in international economies. While VTI does not hold any international stocks directly, many of the large companies represented in VTI conduct a substantial percentage of their business overseas. Thus, a portion of your investment depends on the international economy. 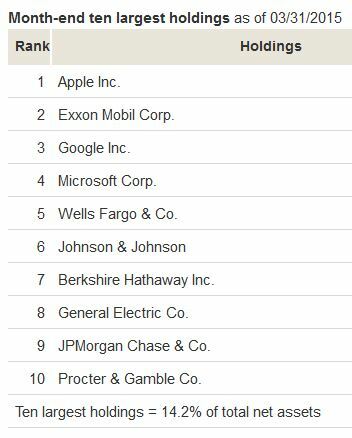 You will own an interest in the nations’ largest companies stocks. Over 14% if the fund’s total assets are invested in the nations largest and most successful companies. You will benefit from their success. The diagram below shows that most (unenlightened) investors are unable to earn what the market has to give. The average investor FOLLOWS trends, acts on hot tips, pays advisors too much, pays fund managers too much, buys high and sells low. Most investors fail to come close to getting what the market has to give. VTI IS the market. Your return will be exactly the same as “the market return” indicated by the S&P 500 Index fund bar (9.00%) in the diagram below. The S&P 500 index reflected in the diagram above is an index fund just like VTI. There is no significant difference between VTI and S&P 500 and the DOW. You can use the S&P 500 Index Fund if you would be more comfortable. VTI has outperformed S&P 500 over the last 15 years. Is VTI the ONLY Security You Need? YES – because it performs as well or better than the Dow Jones Industrial Average and that is all we want to do. We are NOT trying to get “better than average” returns. We will be happy with what the market averages. Having just one security in your portfolio eliminates all kinds of decision/action opportunities. Each decision/action introduces an opportunity to make a mistake. By eliminating as many decision/action opportunities as possible, the chances that your retirement portfolio will be enormous ($$$$) are significantly increased. VTI cannot go bankrupt. It is a company that holds shares in 3795 separate businesses. It’s value is not going to plummet because its CEO has been sleeping with the enemy or anyone else. While diversification is presented as a way to accommodate an IRA Investor’s risk tolerance, there are many problems with implementing a diversified portfolio. Each security in a portfolio imposes a transaction fee (unavoidable) each time it is purchased. If you have five securities and invest monthly into each security, you will pay 5 transaction fees. For example, investing a total of $200/month in 5 different securities will cost you $4.00 – $8.00 for EACH security purchased. This $20-$40 of your $200 will go toward fees. You will end up only investing $160.00 – $180.00. With only one security (VTI) you pay only one transaction fee and get $192 -$196 of your $200 invested. For “The Plan” to work, you must understand and embrace the fact that using an index fund, specifically VTI, as your investment vehicle is the ONLY way 98% of us should be investing. For incontrovertible proof that an index fund is the best mode of investing, read at least one (preferably all) of the articles below. How Charles Schwab Got Religion on Indexing. Click HERE. There is no reason to feel uncomfortable about having VTI as the only security in your portfolio. An ETF, (Exchange Traded Fund), similar to a mutual fund but has several features that make it a better investment vehicle than the traditional mutual fund. The advantages are technical and will be explored separately. * VTI Is An Index Fund: What is An Index Fund? An index fund is an investment fund that aims to replicate the movements of a specific financial market. Whenever an investor purchases an index fund, s/he is actually investing in the performance of an underlying bundle of securities. The managers of an index fund follow a set of rules of ownership that are held constant, regardless of market conditions. The Dow Jones Industrial Average, “The Dow”, is an example of an index. The value of “The Dow” represents the collective performance of the 30 large stocks that are in “The Dow’s” bundle of securities. 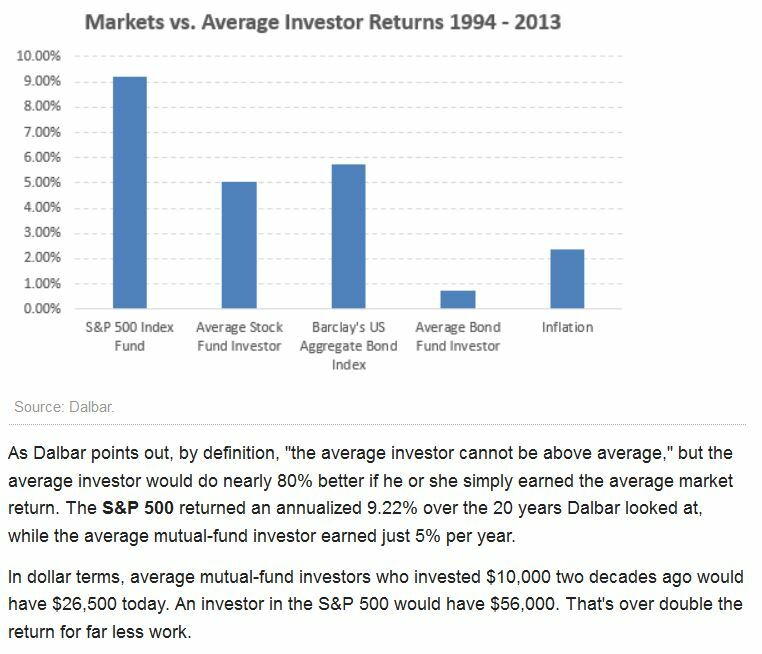 Note: For the period of interest, 20+ years, index funds outperformed nearly 80% of the actively managed funds. So why not invest in the 20% of actively managed mutual funds that did outperform the S&P 500? No single fund outperformed the S&P 500 over a 20 year period. It is impossible to know, 20 years earlier, which of the 3500 mutual funds would outperform the S&P 500 each year. The funds that outperform the S&P 500 in one year are not the same funds that outperform the S&P 500 the next year. You cannot chase performance. Confirmation of this truth can be found here, “The Dying Business of Picking Stocks“, an article from the Wall Street Journal, Oct 17, 2016. For an hour long tutorial on the advantages of index funds, you can watch this documentary, Index Funds, from Index Fund Advisors (the ONLY investment advisor firm, besides IFR™ that you should trust). The CRSP US Total Market Index tracks 3795 USA stocks. The index includes large-, mid-, small-, and micro-cap stocks regularly traded on the New York Stock Exchange and Nasdaq. 4 Responses to Why VTI? I remember that some time ago the target ETF was DIA, now is VTI. You show that VTI is equal or better than DIA. My question is: are the “strategy” in progress? Are you searching for a ETF that is better that VTI? Why not a world ETF? How can you assert that U.S. market perform better that other? Not searching for another ETF. VTI has everything: covers all sectors, covers all styles (large cap, small cap, etc), covers international because many companies in VTI are also players in the international markets. Not a world ETF for the reason mentioned; VTI indirectly plays in the international markets. I do not assert that U.S. markets perform better than others. I look at performance over a long term and they all come out about the same so just pick the one (VTI) that somces closest to consistently mimicking what the total markets (US and Internatinoal) do. VTI is currently trading near its 52 week high. The Shiller S&P 500 PE Ratio (http://www.multpl.com/shiller-pe/) is currently well above the average. How should one approach index investing when the market appears to be too “high”? While I know it is not wise to time the market, isn’t there a greater likelihood that the index will decrease than increase? What is the likelihood that an index never recovers, or takes decades to break even? Should this be the greatest fear for index investors? You sound like you are a trader or market timer. I don’t know if you have seen much of the website but it is geared to the first time investor who hasn’t a clue what to do and has 20 years before retirement. A 35 year old has a 50 year investment horizon (30 to age 65 retirement, 20 life expectancy to 85). Given that scenario, it doesn’t matter what the market does in the short run. It will go up in the long run. If it doesn’t everyone’s goose is cooked – insurance companies, pension plans, etc. There IS a greater likelihood that the index will decrease … in the short run. As you noted, things are near an all time high. There will be a cooling off period – probably not longer than 4 years because there has been only one period (1928-1932) where the market fell four years in a row. There have been 112 four year periods where the market did not decline four years in a row. Likelihood that it NEVER recovers? 1%. That would mean the entire world economy is at it’s peak right now and everything, everywhere will just go down from this point on. In that case it would be a world wide depression – we’re all screwed to forget about it. Decades to break even? If you are dollar cost averaging during these below “even” periods, you will make out just fine. See my dollar cost averaging page. Should this be the greatest fear for index investors? Yes and it is the only one. Nothing else to fear. That’s what makes index investing so great.